(October 13, 2012, Kandy, Sri Lanka Guardian) Buddhist petitioners have successfully filed a case at the Indian Supreme Court seeking to overturn the Bodh Gaya Temple Act of 1949. That legislation had enabled a shared Hindu and Buddhist management of Bodh Gaya. Nehru sponsored this consensus arrangement in order to roll back the Saivite Mahant's, until then, exclusive control over temple administration. The Buddhists are now keen to secure monopoly control over what they consider to be their sacred space. It is likely that the panel of two Supreme Court judges looking into the case will rule in their favor, unless checked. Any change in the shared administrative arrangements of Bodh Gaya should be linked to a resolution of the long-standing dispute over who controls the entirety of the sacred space in Varanasi (Benares) and Mathura, not to mention how Hindu temples are administered in Tamil Nadu and Kerala. Hindu activists should make the case for there to be a uniform policy framework that governs all religious institutions in India, be they Christian, Muslim, Sikh, Buddhist or Hindu. One can not have separate principles, differentiated by religion, to govern the administration of places of worship where Hindus alone lack say in the running of their own sacred sites. A Supreme Court ruling that removes a centuries-old Hindu presence in the management of Bodh Gaya will reinvigorate neo-Buddhist radicalism in India. The Ambedkarites will proceed to launch similar litigation to retrieve other alleged Buddhist sites. The long-term goal is to secure international status for Bodh Gaya akin to what the Vatican enjoys and what is claimed for Jerusalem by the Roman Catholic church. The objective is to ensure that the Bodh Gaya enclave is an international entity insulated from Indian law. The Buddhist petitioners at the Supreme Court include the Japanese-born Bhante Arya Nagarjun Shurai Sasai and ethnic Tibetan Wangdi Tshering of Darjeeling. Bhante Arya Nagarjun is linked to President Mahinda Rajapakse of Sri Lanka. He is a Buddhist radical who routinely attacks Hinduism. He should be extradited to his native Japan where he can preach to his own people whose adherance to Buddhism has been in terminal decline. 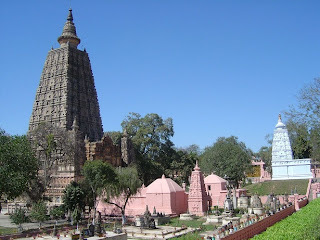 The Mauryas and the Guptas helped build and refurbish the temple at Bodh Gaya. The Guptas, while sponsors of the Hindu high tradition, protected Buddhism in the spirit of Hindu tolerance. The Delhi Sultanate sacked Bodh Gaya in the 13th century which was then abandoned and neglected for three hundred years until Ghamandi Giri, a Saivite Hindu Mahant moved into the premises in 1590 thereby preserving the structure. Had he not moved in, the temple would have collapsed due to neglect. The Hindu Mahants had maintained the temple for 300 years. Hinduism, after all, embraces all humanity and promotes religious pluralism. This brings us to the subject of Hindu control of their sacred space in Varanasi and Mathura. The Gyanvapi or Alamgiri Mosque dominates the Varanasi skyline and overshadows the Kashi Vishwanath Temple, Hinduism's most sacred place on earth. Hindus consider Varanasi to be the holiest city in the world. The 17th century mosque is situated on the original site of the Kashi Vishwanath temple that was demolished by Aurangzeb. The 71 meter high Islamic minarets are the most conspicuous feature in this epicenter of Hinduism. The mosque was recently expanded and towers above the Hindu sanctum sanctorum. The Krishna janma bhoomi in Mathura is likewise a very sacred Hindu site. The Shah-i-Idgah mosque stands on the original site of the Krishna Temple demolished by Aurangzeb. The modern Kesava Deo Temple was only rebuilt in 1965 adjacent to the original site. If the Supreme Court were to rule that Bodh Gaya be under the exclusive management of Buddhists, then the same should apply to the control of Hindu sacred space in Varanasi and Mathura. The immediate linking of the two separate issues will immediately give reason to the Supreme Court and to India's Attorney General to pause before making any hasty judgement on the Bodh Gaya issue. The Buddhist petitioners demand exclusive Buddhist control over the management of Bodh Gaya. Yet the administration of centuries-old Hindu temples under the Hindu Religious and Charitable Endowments Act of Tamil Nadu and the Hindu Religious Institutions Act of Kerala is often subject to ideological and political interference by ruling state governments where atheists with an ideological animus against Hinduism are placed in charge of Temple Management Boards or Devaswoms when ever the DMK and the CPI (M) are in power. Such individuals divert Hindu resources for non-Hindu activity. Hindus need to regain control over the administration and finances of their own temples in Tamil Nadu and Kerala. Should the Supreme Court over rule the Bodh Gaya Temple Act, it should in similar fashion over turn the Hindu Religious and Charitable Endowments Act and the Hindu Religious Institutions Act. Many a Hindu activist would claim that Hinduism and Buddhism are one and the same. Buddhists do not make that claim or emphasize that affinity. They view themselves as a separate and distinct dispensation. Buddhist exclusivism has impacted adversely on Hindu interests in Myanmar where one million Tamil, Bengali and Marwari Indians, many of whom were Hindu, were expelled in 1962. It impacted on Bhutan which evicted 107,000 Hindus of Nepalese antecedents between 1985 and 1991. These people had lived in Bhutan since the 1890s. A Buddhist-sponsored intolerance impacted on Sri Lanka. Sri Lanka disenfranchised one million Tamil Hindu plantation workers of Indian antecedents in 1948 and proceeded to repatriate many of them to India in the 1960s and 1970s. I will omit reference to the subsequent civil war in Sri Lanka that pitted the Sinhalese and indigenous Tamils, 85% of whom are Hindu, with several tens of thousands killed in a 25 year period. Buddhists have been intruding into Hindu space in Sri Lanka with Buddhist images placed this year within the precincts of the ancient Saivite Hindu temples of Tirukoneswaram (Trincomalee) and Tirukethiswaram (Mannar). Literary evidence indicates that Tirukoneswaram existed as a Hindu place of worship in the 4th century while Tirukethiswaram was already an established and revered Hindu temple in the 7th century. Kathirkaamam, an old Hindu place of worship dedicated to Skanda or Kartikeya, that may likewise date back 700 years or more, is now exclusively managed by Buddhists. The medieval-era Vishnu Temple at Dondra has a similar Buddhist management. The objective is to erase the distinct Hindu character of these places and to Buddhicize them with a view to deny the Hindu presence in Sri Lankan history. Nepalese Buddhists led the movement to dis-establish Hinduism as the official religion of Nepal in 2008. They successfully demanded that the 10 day national holiday of Dussehra or Dasain be pruned down to accommodate Buddhist holidays. In all four cases i.e. Bhutan, Myanmar, Nepal and Sri Lanka, Hindu interests were impacted. Buddhist monks have likewise intruded into the sacred space of the largest Hindu temple in the world - Angkor Wat dedicated to Vishnu in Cambodia. The Ambedkarite Neo-Buddhist movement in India, inspired by rabid Sinhalese monks such as Saddhatissa Thera, is viciously anti-Hindu. Its denunciations of the Hindu religion are severe, harsh and continuous. They erroneously claim that India's scheduled castes were originally Buddhists and that the Devadasis were descendents of Buddhist nuns! The Ambedkarite neo-Buddhists reject the cardinal Hindu-Buddhist doctrine of rebirth and Samsara. They reject the veneration of the Hindu Gods, revered in traditional Theravada Buddhist societies. The latest litigation at Bodh Gaya is once again an example of the politics of hate. The neo-Buddhist edifice in India is a house of false cards and twisted logic. It is important therefore to prevent any immediate change in the Bodh Gaya arrangement unless it is linked to a quid pro quo i.e. change in the current arrangements in Varanasi and Mathura, and a revamp in the administration of Hindu religious endowments and Devaswoms. Further, a change in Bodh Gaya would mean that the Congress party-introduced Places of Worship (Special Provisions) Act of 1991 that froze the religious affiliation of all places of worship as at 1947 would stand annulled. This would allow Hindu activists to reopen the issue of Varanasi and Mathura, not to mention ensure the institutional autonomy of the cash-rich Hindu Religious and Charitable Endowments in Tamil Nadu and Kerala. The BJP, in particular, has an obligation to keep a close watch on developments in Bodh Gaya as it impacts on its core constituency in what is a caste-fractured swing state with disproportionate impact on a closely fought national election in the next year. Nice Article and timely. This needs wide circulation. Thank you for sharing.